or by phone at (715) 566-0921. Mary Jedlicka Boisvert, Vice President of ASHDA. Hello fellow horse lovers from beautiful Wisconsin! My name is Mary Boisvert, Vice President and Director of Territory 1 of the American Sugarbush Harlequin Draft Association. A wonderful group of like-minded people that wanted to preserve and breed forward the Sugarbush Harlequin Draft horse, as envisioned by Everett Smith, put this new organization together. I am thrilled to have been invited along on this journey to save this amazing breed. 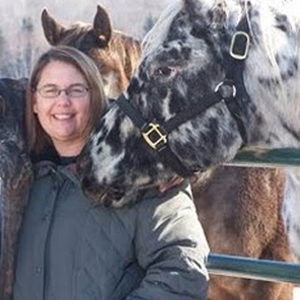 American Sugarbush Harlequin Draft horses are sweet enough for the whole family! I am very honored to be the Vice President of this registry and could not ask for better people to work with in this endeavor. A little about me, I have loved horses since I saw my first one at 2 years old. I, along with my trainer, show at halter in the ApHC and plan on showing our ASHDA horses next year at halter. I have had horses my whole life but have only started showing since my early retirement from the USDA in 2010. My husband and I own Boisvert Farms in west central Wisconsin. I have always had a love of the Appaloosa and also the Percheron and one day while searching the internet stumbled across this breed and thought “what a perfect combination”! We currently have a registered American Sugarbush Harlequin Draft stallion and an Approved Cross Appaloosa stallion that we are using for our breeding program. My goals as Vice President are to help this breed grow and thrive. I am currently secretary of 2 saddle clubs and show secretary of an ApHC club in Wisconsin and Minnesota, so bring a wealth of information with me. There are so many disciplines where this wonderful breed will excel. From Halter to Western Pleasure to Dressage or Hunter/Jumper, they can do it all and do it wonderfully! The American Sugarbush Harlequin Draft is full of opportunities.